Beethoven's 5th symphony is, arguably, the most perfect symphony ever written. Everything in it is inevitable but it is not predictable. I have never heard a recording I did not like, though I like some more than others. There is nothing wrong with Stienberg's recording, but I find I prefer Furtwängler, Klieber, and Bruno Walter. Let's face it, in all honesty I would have preferred another Stokowski coupling, but this is not bad 5th and the coupling is worth the price of the disc. 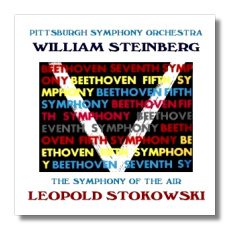 The 7th Symphony was one of a batch Stokowski made for Universal in the late fifties. They were recorded by what had been the NBC Symphony Orchestra at midnight sessions. EMI issued most of those recordings a few years ago in an excellent set that I highly recommended. Unfortunately, the Beethoven was not among them because the stereo master had been lost. Mark Koldys, however, has unearthed a stereo reel-to-reel tape and has transferred it to CD for us. The sound is excellent, in fact somewhat fuller than the EMI set. Stokowski made three recordings of the 7th. I have always considered his Philadelphia recording an essential, desert island disc. The last one, made for Decca, sounded excellent, but was not as charismatic. This 7th is as charismatic and in stereo. Over the several nights I listened to the recording I found I couldn't help but dance, waving my air baton (okay, hands) about like someone possessed. Of course, I was possessed by the music. Be warned that there are Stokowski-isms in here. He ignores the extra repeat of the trio section, which was Beethoven's "joke". As Mark put it, though, "I think that by cutting this extra repeat, Stokowski in fact restores Beethoven's joke" because now the audience is "again" surprised. I kept returning to the slow movement. The strings play with a dark burnish that may be a product of the recording circumstances. This is such a wonderful recording that we should all thank Mark Koldys for his trouble. Now, listen to this disc and tell me that music doesn't convey information. Here is an interesting experiment. Listen to Beethoven's 7th. Then listen to Mahler's 4th and realize that less than a century passed. Then listen to Martinů and realize that less than a half-a-century passed. Then think about change.